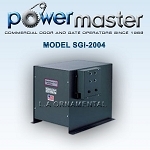 Slide Gate Operator, as recommended for cantilever, rolling, or overhead sliding gates. 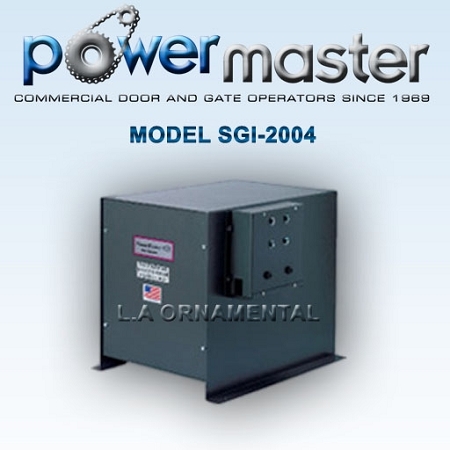 For Use on Commercial or Industrial Slide Gates (Up to 80' Wide or 2400 lbs. Max.) High Starting Torque Motor Full Overload Protections 24 VAC Control Circuit Heavy Duty, Full Voltage, Reversing Contactor 3 Button NEMA 1 control Station Included On/Off Power Switch Left/Right Direction Switch. Solid state control board with diagnostic LED s to indicate all input and output functions. Maximum run timer for equipment protection (self-adjusting). Emergency control enabling circuitry for safety with security. Magnetic gate lock control circuitry with 115 Volt output terminals. Integral, current sensing, anti-entrapment circuitry with independent opening and closing sensitivity adjustment. 1/2 HP., 115 Volt AC, 6 Amp., 1 Phase, instant reversing, switchless, PSC motor, with thermal overload protection and high speed ball bearings for smooth, quiet operation. Two grounded 115 Volt AC, 15 Amp. Convenience receptacles. Heavy duty #10 Ga. Galvanized steel frame providing a strong and durable unit. 40:1, oil bath type gear reducer for long service and smooth, quiet operation. Heavy duty #50 drive chain with a spring loaded tensioning system for smooth starts, stops and reversals. Heavy duty pillow block type ball bearings supporting output drive shaft and enabling extended endurance under heavy loads with low maintenance. Padlockable drive disconnect with brass slide for manual operation in case of power failure. Positive chain driven rotary limit switches for precision gate positioning. Settings are never affected by manual operation. Post or pad mountable for strong solid installation. Available horse power: 1 1/2 HP. Maximum gate weight: 2000 LBS. Maximum cycles per hour: 45 CPH. Maximum gate width: 80 feet. Shipping weight: approx. 275 LBS. Gear Box Heater (for cold climates). Thermostatically Controlled Cooling Fan (for hot climates). Push Button with Keyed Lockout. Padlockable Option to secure cover for increased tamper proof protection.